What can the FIR be Lodged against in Pakistan? Cognizable Offence:- A Crime wherein the Police do not require instructions from the Court (or a warrant) to arrest and detain someone, or to proceed with registering the FIR/Investigating the Matter further. Non-Cognizable Offence:- A Crime where the Police has no authority to arrest or detain anyone without a warrant, and would need a Court Order to Investigate the matter. It is the Police’s duty to register the FIR without any delay or excuses, and can lead to disciplinary actions for the Officer’s involved if found not doing so. When an application is presented to the Police Station, and is submitted, it is then assigned to an Investigating Officer (ie ASI or TASI etc) who then proceeds to investigate the matter. The FIR Application can be drafted by yourself, or the Police Officer (Usually an Admin Officer in the Police Station) in English or in Urdu. What to do if your FIR is not being lodged? In such cases, you can report this to a higher ranking officer (Usually the DSP or SP, in Punjab you can do this by dialing 8787) or you can approach the DIG or IG. If a FIR is falsely attempted/claimed, this would be punished under S 182, and the FIR would need to be quashed via Court Proceedings. We can offer assistance here also. If a FIR is not lodged, or is being delayed unnecessarily, after exhausting the above mentioned procedures, you may file an Application to the Justice of Peace (under Section 22-A / 22-B) to file the FIR or to expedite the Process. This is where our Criminal Lawyers can assist you further. 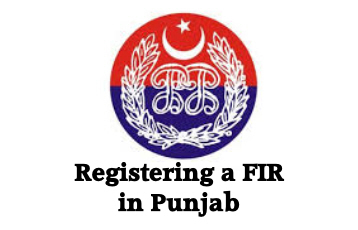 To submit a FIR yourself is free of any and all charges, and if anyone is found asking you for money for the purposes of submitting a FIR, they will face strict follow-ups by the relevant departments involved. Our lawyers will charge only for their assistance in your matter, should you require it, and Our Lawyers also abide by our “24Justice.pk Fixed Fee Policy” which means you do not have to worry about any unknown and hidden extra charges.